Unfortunately, the dress you are looking for (Style: KIM-D23678, Name: KIM-D23678) is no longer available. Under $50, this long-sleeve black holiday dress is the stylish steal of the season. 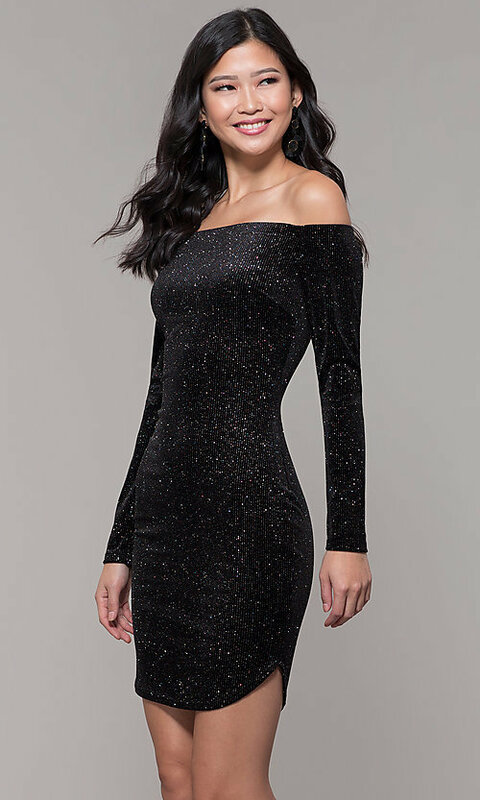 Made of sparkling glitter velvet, the little black party dress offers a playful look that's ideal for festive semi-formal events. The fun and shimmering black fabric skims the curves from neckline to hem to accentuate the figure with the snug fit. An off-the-shoulder neckline offers a romantic touch to the design as it highlights the upper body and leads to soft long sleeves. Taking the flair up a notch, the short skirt extends over the legs with a trendy shirttail hem to finish this black holiday dress on-point.